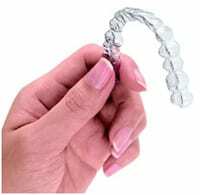 There is a solution to having straighter teeth without having to wear metal braces; it’s invisible braces Liverpool, also know as Invisalign. This type of treatment offers you the choice of wearing a clear and sometimes removable appliance while straightening and aligning your teeth. Invisalign® is a semi-invisible way to straighten teeth using a series of custom made, nearly undetectable, removable aligners. Whether your teeth are crowded, too far apart or have shifted since previously wearing braces, you’ll have a new reason to smile. Upon initial examination, together we decide if Invisalign is the right choice for you. Using the latest advances in 3-D computer technology, Invisalign® carefully translates your orthodontist’s instructions into a series of precisely custom-made aligners. You wear each aligner in sequence for two weeks at a time and gradually, millimetre by millimetre you will achieve the intended result – straighter teeth. Invisalign® – show off your smile, not your braces Nothing is as important as a genuine and heartfelt smile. Whether in your professional life or when you are out socialising, an attractive smile can make you feel happier and more relaxed – as well as making the right impression! Could Orthodontics Give You That Perfect Smile?